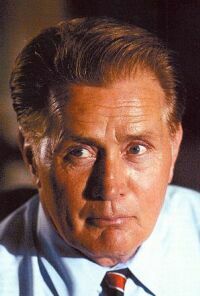 Looking for more about Martin Sheen? Try some of the links below for articles, general information, and pictures. Martin Sheen on IMDB ~~ Biography and filmography on Internet Movie Data Base. Martin Sheen Biography ~~ Biographical information and a listing of milestone roles from Turner Classic Movies. An Inner Sheen ~~ From Guardian Unlimited. One of my favorite articles about Martin Sheen, with information on his early acting years, his experiences on Apocalypse Now, and his family. Acting on Faith ~~ Brentwood Magazine. A candid article and pictures form the Sept/Oct 1999 issue, in which Martin talks about his life and his new role as President Bartlet on The West Wing. First screen is the magazine's cover shot of Martin; click on his picture to access the article and more images. The New Catholic Miscellany ~~ 1999 article. Martin Sheen acts on his faith and for social justice. Global Tribe - Voices ~~ Martin Sheen speaks out on poverty, faith and social activism. The West Swing ~~ Travel & Leisure Golf (May/June 2001). How a rebellious caddie from Dayton Country Club became the most powerful politician in the free world. On television, anyway. A detailed and interesting article on Martin Sheen, his work, and his interest in golf. Reader's Digest ~~ Martin Sheen, The Uncut Interview from Reader's Digest, by Michael Beschloss. Over 60 pages covering topics ranging from politics to his personal philosophy. This article is in ".pdf" format, so Adobe Acrobat reader is required for viewing. Martin Sheen's Las Vegas ~~ Learn about Martin's favorite hotels, restaurants, shows and more. From "American Way" magazine, 2001. One on One With Martin Sheen ~~ Sheen talks about society, politics and labor in America. 2003. Martin Sheen, Journeyman Actor ~~ One of the first Martin Sheen sites on the web. Scroll down the opening page and click to enter. Lots of information on his family and film career. In the interview section, be sure to read the transcript of Martin's AOL chat at the time he was filming Spawn. Ramon Estevez ~~ A great spot for information about Martin's son, Ramon. Includes articles, pictures and a great message forum for the fans. Ramon occasionally posts messages, making this a really fun site! Renee Estevez ~~ A website for Martin's daughter Renee, who is also in the acting profession. Seen as Nancy on The West Wing, she has worked with her father on several film projects. Check this site for news on her career and some great pictures, including some of her dad. Jeff Dunas Photography ~~ A selection of Martin Sheen portraits by professional photographer Jeff Dunas. Click on any image for a larger view. Enjoy!